Rackspace Cloud Server as Remote NeuroDebian Desktop is very easy to configure and work collaboratively by group of research workers geographically living far. First read the article on Installing NeuroDebian Packages on Cloud Server for Neuroscience and second read the possibility to use a Cloud Server like your own computer, situated far away. The major point is this is intended for the doctors who are working on modern Cognitive Science derivative subjects and has decided to use NeuroDebian as the project is nicely gathering all here and there scattered projects, mostly individually done in widely varied programing languages and sort of platforms, starting from Python to GENESIS. I have used Next Generation Cloud Server from The Rackspace Cloud with Debian Squeeze and 4 GB of RAM. The processor is 64 bit, you can use up to 30 GB of RAM and Scale up or Down when needed. In the example, a Windows PC as my computer has been used, so I used PuTTY as SSH / Telnet client. TightVNC viewer has been used as VNC viewer, the quality of image of remote Debian will be better on Mac or Linux computer of yours. Rackspace Cloud Server as Remote NeuroDebian Desktop : Converting Debian to NeuroDebian ! Simply follow the steps exactly as written in Installing NeuroDebian Packages on Cloud Server for Neuroscience. The red line has been made active and green one has added. Work on Server is done. You can use SSL to secure the encoding. Exactly follow the guide on Ubuntu 12.04 LTS Rackspace Cloud Server as VNC Remote Desktop to launch your own Rackspace Cloud Server as Remote NeuroDebian Desktop to launch your Remote NeuroDebian desktop. 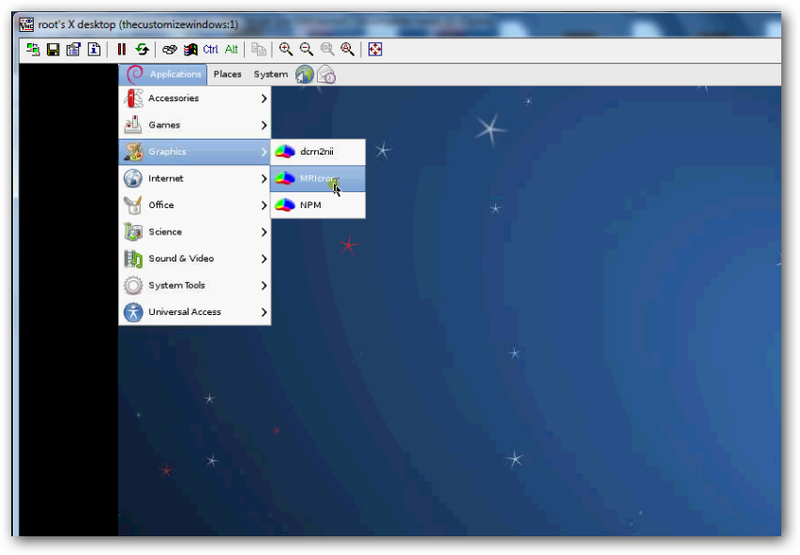 There are VNC softwares for Mac and Linux as well. This ends the guide on Rackspace Cloud Server as Remote NeuroDebian Desktop. This Article Has Been Shared 4353 Times! How to set VNC up on a Linux Server with Rackspace Cloud Unmanaged Server plus tips on suitable Linux distro, which clients to use – all in one compact article. Cite this article as: Abhishek Ghosh, "Rackspace Cloud Server as Remote NeuroDebian Desktop," in The Customize Windows, October 9, 2012, April 21, 2019, https://thecustomizewindows.com/2012/10/rackspace-cloud-server-as-remote-neurodebian-desktop/.